There is some surprising information hidden in a recent AP poll. Overall, the poll found 43 percent oppose the health care plans being discussed in Congress, while 41 percent are in support. However, when the consequences of these choices were put in the poll questions, the results dramatically changed. When poll questions were framed broadly, the answers seemed to indicate ample support for Obama's goals. When required trade-offs were brought into the equation, opinions shifted — sometimes dramatically. In one striking finding, the poll indicated that public support for banning insurance practices that discriminate against those in poor health may not be as solid as it seems. A ban on denial of coverage because of pre-existing medical problems has been one of the most popular consumer protections in the health care debate. Some 82 percent said they favored the ban, according to a Pew Research Center poll in October. In the AP poll, when told that such a ban would probably cause most people to pay more for health insurance, 43 percent said they would still support doing away with pre-existing condition denials, but 31 percent said they would oppose it. Support for banning coverage because of pre-existing medical problems declined by almost 40% when it was explained to people that their health insurance costs would likely increase because of this change. Support for mandatory health insurance coverage flipped when people understood there would be a federal penalty for those who failed to take insurance. For example, asked if everyone should be required to have at least some health insurance, 67 percent agreed and 27 percent said no. The responses flipped when people were asked about requiring everybody to carry insurance or face a federal penalty: 64 percent said they would be opposed, while 28 percent favored that. Both the House and Senate bills would require all Americans to get health insurance, either through an employer, a government program or by buying their own coverage. Subsidies would be provided for low-income people, as well as many middle-class households. This poll seems to indicate the public is poorly informed about the consequences of passing Obamacare. Once the trade-off are made clear, support for the Democrats health care reform bill collapses. 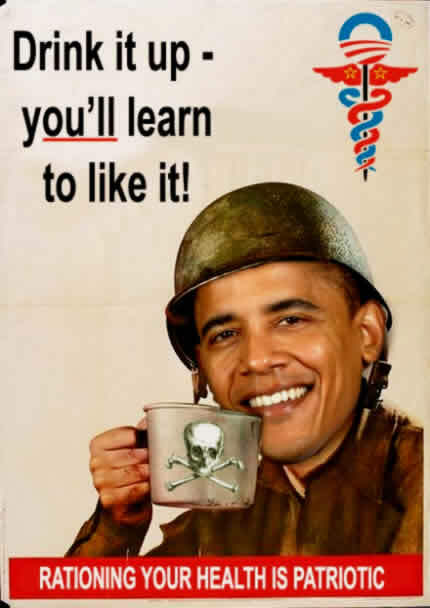 Unfortunately, the state run media will continue to shill for Obamacare and do a poor job of educating the public. Sadly, most Americans, especially the left, don't know much in the way of specifics about policy, especially when it comes to this healthcare bill. They know how to chant "Hope and Change" and shout their platitudes, but they haven't read the bills and they haven't considered what the language actually means.